The newly open Celestial Dynasty has a banquet menu worthy to check out for! Besides being able to accommodate 40 tables in the main dining room, there’s plenty of private rooms too for private functions. The gold, cream and dark wood theme interior reflects a sense of elegance with minimalist. With a long hall that allows a grand entrance, Celestial Dynasty is great for a wedding march. There is also a stage at the end of the room to allow entertainment for functions. We had the honors of a sneak peek at their banquet menu and found the dishes to be uniquely delicious. 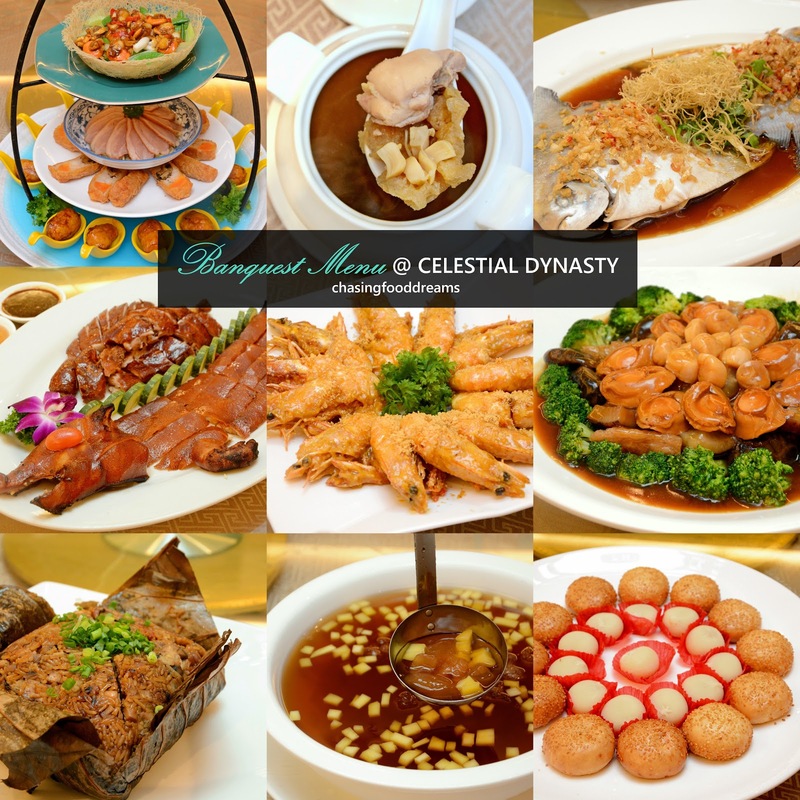 While more restaurant tends to go the classic route, Celestial Dynasty features creative renditions of classic. Our tasting menu of the evening was Summer Scent 天赐良缘幸福满宴 priced at RM1188 per table of 10 pax. First up, a beautiful three-tiered presentation of Summer Platter, summarizing the classic four season platter of appetizers in banquet menu. The first top tier is Stir Fried Scallop with Tom Yum Sauce. Moreish with a lightly spicy heat and tang of aromatic lemongrass tom yum. Lots of textures too from the plump scallops to crunchy sweet peas, onions, bell peppers and mushrooms, the dish is very enjoyable. The last one is a delectable Deep Fried Bacon Roll with Honey Sauce. Bacon makes everything better and this one has an unctuous salty sweet flavour of yumminess. The soup course features a nutritious Double-boiled Farm Chicken Soup with Pacific Clam and Shitake Mushroom. The broth has a clean and delicate chicken essence that is tummy warming. When a perfect classic gets a twist, it can turn out either ways. Luckily, the Roasted Platter of Curry Suckling Pig and Roasted Duck won excellent brownie points from everyone. The addition of subtle curry spices elevated the aroma as well as the flavour of the crispy skin piglet. An excellent rendition from a timeless classic. The roasted duck is also succulent and well marinated with a lovely crisp lacquered skin and juicy meat. For the fish course, the Steamed Pomfret and Radish with Superior Soy Sauce makes a good choice and possibly the best way to enjoy the freshest of the fish with minimal ingredients. The Deep Fried Crispy Sea Prawns with Salted Egg is lusciously aromatic and gorgeously golden at sight. The prawns, well coated with that unctuous and yummy salted egg sand, is decadent and lip-smacking yum. Braised Superior Seafood and Abalone with Brown Sauce shows off the premium treasures of the sea. The lavish abalones along with sea cucumber, dried scallops and mushrooms are nicely braised in a tasty abalone and oyster sauce. A sumptuous and lavish dish indeed! There is also the obligatory carb dish at the end of the course meal. The Fried Glutinous Rice in Lotus Leaf is decent and has sufficient flavours to make it a very enjoyable last savory course. Dessert is really good and features a cold sweet broth along with other sweets. The Chilled Aloe Vera with Mango and Sea Coconut is refreshing and fruity. It also goes really well with the Deep Fried Sesame Bun and Chilled Mochi. Though nothing out of the ordinary, the desserts were still very well-made and left a sweet and tasty after taste to end the dining experience. Life is about the chase.. chasing after your dreams, chasing after your loves and chasing after your passion. This is my journal on my chase for my dreams. Disclaimer: The opinions and experiences articulated on this blog is entirely based on my personal taste buds and may be at odds for other foodies. Respect is mutual! All photos shown in this blog belongs to me. If you need to use them for some reasons, please contact me at my email. Do Not Remove my watermark without my permission. Lee Hong Kee Restaurant, Kampung Baru Sg. Buloh: New Dishes Awaits! The Lobsterman, SS2 Petaling Jaya: King of Crustacean Lobster Special Set Menu!